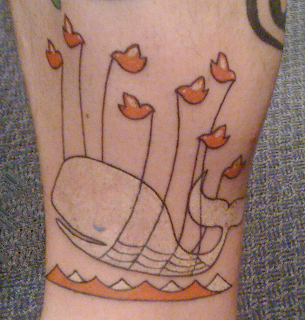 At the Triangle Tweetup last night @critter was sporting his latest tattoo: The Fail Whale. He was kind enough to allow me to take a photo. It's a very cool tattoo and I appreciate his agreeing to let me post it. Poor Twitter. It's kind of sad when an image that depicts your failures has become the image that the rest of the world knows you best. How is that whole branding thing working out for you? I do have to say that, while I liked twitter, my usage has fallen off. More often than not for the past two weeks, I cant access beyond the first page of updates. Something tells me that Critter isn't too worried about what anyone thinks. :) I think he'll have a lot harder time explaining the Cold Fusion one more than the fail whale. I still use Twitter but it seems to be related to my schedule. I definitely drop off when I'm traveling. I haven't done an actual post on Twitter in a long time. Been doing everything through Identi.ca. Nice comment Critter! Agreed. Thank you.